Finding the time for fitness and recreation can be hard with a young family, so why not include them in your exercise routine? 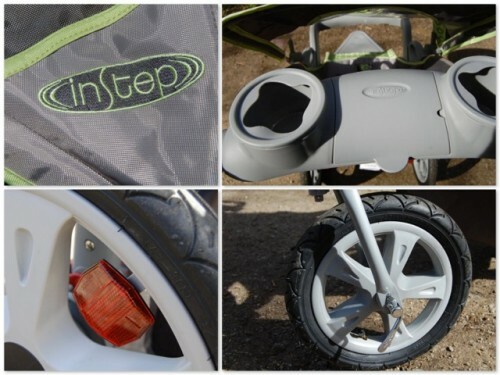 That is exactly the motto of jogging stroller maker InStep, and they deliver this with their stylish, high-performing products at a value price. I recently signed up for an obstacle course fitness event that includes a 5K run and have found the InStep Safari to be the perfect accompaniment to my training schedule. The Safari not only performs well as a jogging stroller but has also proved to be an excellent everyday buggy to push my son around town in, thanks to the swivel wheel option. Assembly of this stroller was simple and straight forward. It took under 15 minutes to unpack, pop on three wheels, screw on the fender and attach the parent and child trays. The instructions were easy to read and complete with diagrams to follow along. I did need to top up the air in two of the tires using a bicycle pump, so make sure you have one handy. The InStep Safari can be used as a travel system with most car seats (the manual states that it is compatible with but not limited to Safety 1st, Costco and Eddie Bauer) using the included adjustable safety straps for securing, and the child snack tray cup holder as a place for the car seat to slide into. When using the stroller with an infant car seat it is not intended as a jogger but will provide a nice smooth ride for both baby and you. 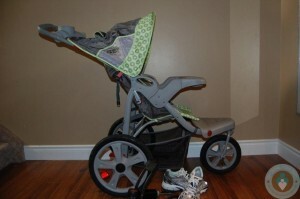 As a jogging stroller the InStep impresses me each time I take it out. The 12” front and 16” rear pneumatic wheels ensure the smoothest ride possible on all terrains. I have jogged on sidewalks, grass, gravel, through a bumpy field, as well as up and down hills and it has surpassed my expectations on all levels. Not only did it handle smoothly on every surface, but my usually wide awake son was able to sleep through most of it thanks to the smooth and comfortable ride. 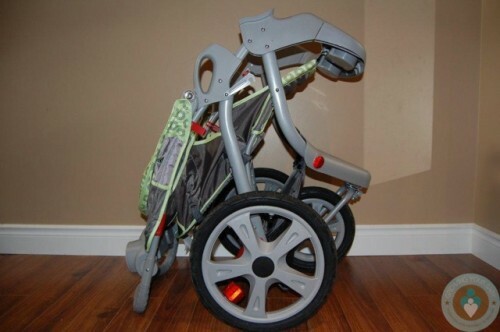 In order for the stroller to be safe while moving at faster than walking speeds, the front wheel can lock into a fixed position. Because the large front wheel is locked while running it is important to take corners widely and a bit slower to maintain control, so for this reason it is better to jog with the bulk of your distance away from too many turns. Having said that, I have done a couple of runs in residential areas and welcomed the slow down around sidewalk corners as a bit of a break. The Safari seat accommodates a child from six months to 50lbs using an adjustable five-point harness. We found it to be quite roomy and spacious, however the seat back is only 18 inches high and my 20 month old son’s head is at the top already. There is still plenty of headroom between the seatback and canopy, but I wouldn’t jog if there wasn’t full head support for my child. The pivoting molded snack tray makes it easy to get your baby in and out and keep them satisfied with a treat and drink. The seat lies back nearly flat and has an easy one-handed strap release to recline. The fabric on the seat and canopy is water repellent and easily wipes down for any minor spills or messes. 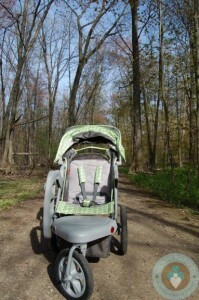 The canopy on the Safari is very strong which is important while jogging or on a windy day, it rotates 180 degrees through five positions, and has a peekoboo window for parents’ ease of mind. Although not the largest canopy, I can ensure my son is always protected from the sun thanks to the large rotation. On an especially windy day recently my son was upset at the wind blowing in his face and I was able to put the canopy all the way down to his snack tray for complete protection and had the peekaboo window tied back so he could still see out on our adventure. This stroller has a very large sturdy storage basket that is accessible from the back and both sides. The parents’ console has a small covered storage space for things like your keys or money, and two drink holders. Along the sides of the Safari are two little pockets that hold the car seat straps – since we are past this stage I use these pockets for tissues and other small items that would get lost in the bottom basket. The rubberized gripped handle is 42” from the ground which is nice and high to ensure no slouching while running. There is plenty of stride room ensuring even the tallest pusher won’t kick the wheels or basket. The parking brakes are on each back tire and take some effort to disengage which I don’t mind as I always have my running shoes on and I know that if I am stopped on a hill there is no chance of accidental rolling. Although the stroller weighs slightly over 30lbs with its easy handling and smooth push it doesn’t feel bulky or heavy at all. I wouldn’t recommend it for travel because of the weight and it really doesn’t fold too compact, but for myself it is perfect to use from home to get to parks, malls, and the running trails nearby. I do like that the tires are quick release and just as easy to pop back on for those wishing to fold it up and take along on a trip. It is spring here but I am confident that the InStep Safari would handle well under any weather condition, whether it be winter snow or a sandy beach in the summer. This is my first time testing out a jogging stroller and I am impressed at how well it handles switching terrains and speeds, keeps my son comfortable, and at an MSRP of $130 it makes a great choice for budget-conscious parents. InStep wants their parents to succeed with their fitness lifestyle and I found something unique on their website: a section called Parent Zone complete with articles and tips related to fitness and nutrition so you can get in shape while spending time with your baby! Thank you InStep for sending us the Safari for review. Vanessa Lachey Grabs A Smoothie in LA!